Why does it work? Cayenne contains capsicum, that’s what makes it spicy. While spicy can hurt, it can also alleviate pain. Crazy huh? 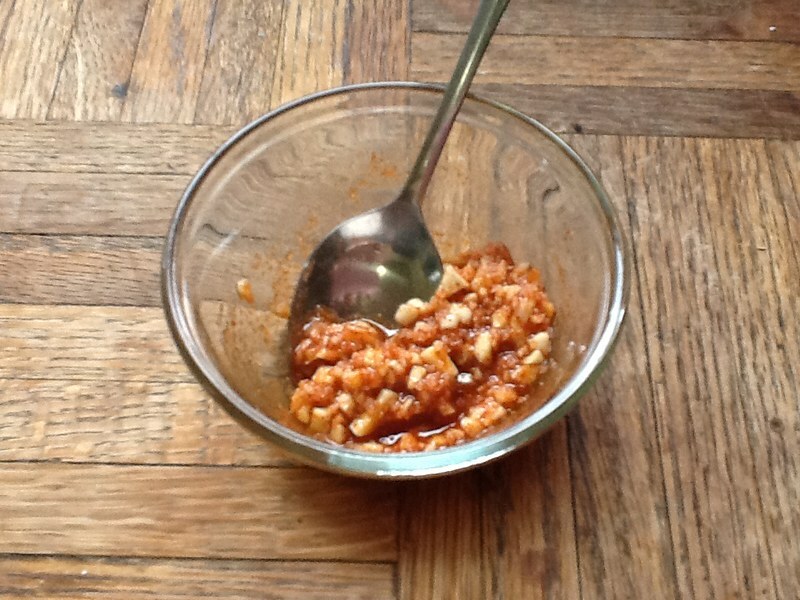 The honey does a great job of toning down the cayenne so it’s really not that hot. My oldest who won’t accept anything spicier than ketchup can tolerate it without much complaining. And it actually really truly works. It’s not recommended to use cayenne in children under age 2. My friend recommends using cinnamon in place of cayenne for younger children. Garlic is best known for it’s antibacterial and antiviral qualities. It’s best to use it in crushed form to release the allinase enzyme which makes allicin, the component of garlic responsible for it’s antimicrobial. Honey, while making the cayenne palatable, also offers benefits. Honey has long been used to ease coughs and sore throats by coating the throat. It also has antimicrobial qualities. The second thing I go for is this quick soup recipe. I actually drink this on a regular basis because it’s so good and nourishing. Chicken stock, when prepared correctly, is very healing. Full of minerals, and gelatin, it’s a prized food in many cultures. Sauerkraut juice is high in vitamin C, B vitamins and probiotics. An egg yolk is the most nutrient dense part of the egg, rich in protein, Omega 3’s, choline and vitamins A, B12 and D. It blends well in soup making it nice and creamy. Just a note of caution, if I do suspect the sore throat is actually strep, this is one of the few situations where I do think antibiotics are awesome. We don’t play around with strep. Untreated strep can cause things like PANDAS, Rhuematic fever and guttate psoriasis. 7 months ago I had strep and didn’t realize it (my throat was sore for just a day). My body reacted in a horrible way and I still have huge welts all over my torso from guttate psoriasis. It’s getting better but it’s still there. If the sore throat doesn’t go away by afternoon and is accompanied by a fever, we go to the doc ASAP. Mix it all together and give 1 tsp every hour until throat is better. Make more as needed. In a mug, mix garlic, egg yolk, sauerkraut juice and cayenne. Whisk in stock and add salt to taste. I decided to try the soup for my poor hubby who is really sick with a sore throat. Like you say, if it’s not any better tomorrow, we’re going to take him to urgent care. Thanks for the recipe! I made the cayenne, garlic and honey mixture for my son this morning. He had fever and said his throat was burning. 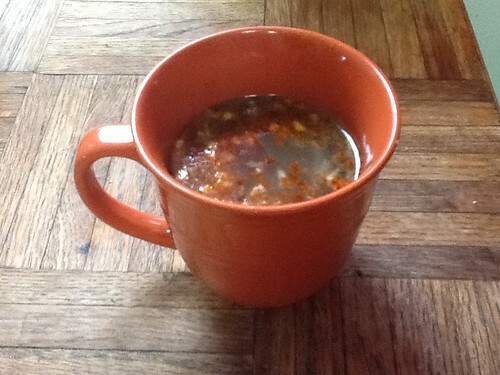 Even though he likes a lot of spice, he didn’t like the mixture (of course, it was before 7 am). I was wondering how much they need to take. He probably only took about a half of a tsp and asked me how fast it was supposed to work. I told him I didn’t even know if that little would work (plus he washed it down with water and followed it up with a conventional cough drop to mask the taste!) In your experience, how much do your family members take before their throats start feeling better? Hi Stephanie. We usually take about 1 tsp every hour until it feels better. My husband actually notices a big difference after the first dose but it usually takes a few doses for me to feel better. Washing it down with water might actually make it take longer to work since it doesn’t get to coat the throat. It’s tough with kids. Maybe try using cinnamon in place of the cayenne and see if he likes it better. This is actually the remedy FOR steep throat that you bare posting, and it works perfectly within 24 hours. If it is still extremely painful in the throat after a week, that is when most naturalists recommend a doctor if all you have are teaditional allopathic “doctors”. This remedy works a greater percentage of the time then pharmaceuticals do, for steep throat. In addition, if something is EXTRENELY virulent which garlic will not work on, there is oregano oil, which I used to cure gonhorrea, which is extremely virulent, has mutated, and is becoming an epidemic in some areas. However, oregano oil shouldn’t be needed for steep throat, as the mixture given here is the remedy that is formulated for that purpose.